Gaspari TV Live Olympia Broadcast! Watch their Facebook live feed from the Olympia Weekend September 16-17! Previous story MuscleTech Neurocore Review with Phil Heath Next story FLEX LEWIS - Video of September 2011's Cover Star and Olympia Contender! Lakewood, NJ. 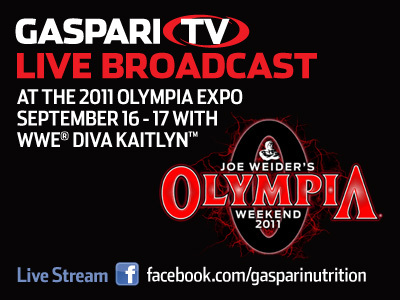 Gaspari Nutrition, a global leader in sports nutrition and supplementation, will host the industry’s first ever live broadcast from the Joe Weider’s 2011 Olympia Expo, September 16-17, 2011 at the Las Vegas Convention Center. Viewers from anywhere in the world can access the live feed on the company’s Facebook page www.facebook.com/gasparinutrition from 10AM PT. to 5PM PT., on both Friday and Saturday. Gaspari Nutrition will give away free samples and promotional items at booth #620 with a special discount code to save money on products and merchandise. Customers will also have the opportunity to take photos and get free autographs from their favorite Team Gaspari athleles. The company will also promote the Olympia experience through an unprecedented giveaway on Facebook and Twitter www.twitter.com/teamgaspari. Gaspari Nutrition, Inc. was founded in 1998 by former bodybuilding champion, Rich Gaspari. Over the past 13 years, Rich and his team have developed a line of supplements under his name, into one of the most formidable and best loved in the world. His determination and love of the sport of fitness has seen a successful transition evident in his unyielding passion for developing the most effective sports nutrition products the industry has ever seen.